In part one of this series, we covered the difference between fiat and commodity money. As countries moved toward a fiat currency, the money supply increased and started to lose value. Part two of the series explored the rise of the central banks. It covered how central banks came into being and how they contributed to the destruction of a nation’s currency by creating a false business boom, then the final economic collapse. Mises is warning us about the same thing that the Holy Spirit through Paul cautions of in the Book of Romans. In Romans, Paul writes of the importance of a man’s faith, rather than his works. When man takes the center of his being away from God, he tends to attribute his success to his own efforts and his failures to others. So, what happens to a society when the ravages of hyperinflation start to consume an economy? What happens when the money dies? 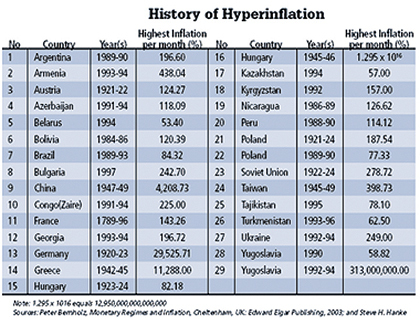 Hyperinflation in a country is more common than we think. Israel went through a period of inflation in the 1970s and ’80s.2 Prices in Israel went from a 13% increase in 1971 to 445% in 1984. People would hoard phone tokens since their value would not change as prices rose. At the time, there was a joke going around that it was better to take a taxi from Tel Aviv to Jerusalem rather than a bus because you could pay the cab fare at the end of the trip when the shekel was worth less. A major contributor to inflation was the government expanding the money supply. The Israeli government tried to automatically raise wages as the inflation rate went up. This move was meant to keep the people from feeling the effects of inflation, since their incomes rose with their expenses, but indexing just added to an inflationary spiral. As the chart above shows, while Israeli inflation was bad, other countries have experienced much, much worse. Money has several characteristics. Its value is stable, it has a high value per unit (meaning you should not have to bring wheelbarrows full of money to the store to buy things), and it is durable; it lasts over time. You try to acquire it because you know it will be useful in the future. That brings us back to the question, what happens in a society where this is no longer true? A society that does not have a strong faith in God has the lives of their citizens turned up-side-down. A person without God in their life will call their entire value system into question. The facts represented in the chart, however, demonstrate that in the last century, many societies fell into the trap of inflating their currency. From previous experience, these societies should have learned that inflation is folly, yet they kept doing it. The reason is that inflation is not just an end in itself; it serves ideological goals as well. Goals like expanding the State, favoring debtors over creditors, and funding wars. Governments actually favor inflation and the social upheaval it causes. At first the effects of inflation are masked to us. Sometimes you have to think about it. For example, oil prices went up because of the inflation of the benchmark U.S. dollar. As a result, airlines’ fuel costs went up. The airlines started to charge more to passengers. Not only did they increase the ticket price, but they also started charging for bags. Now airlines call maintenance delays “Acts of God” so they don’t have to pay for overnight stays at hotels. A delayed plane will keep their passengers on the plane for hours, rather than go back to the gate and pay an additional fee. Post World War I Germany (known as the Weimer Republic) serves as an example of what happens to a country that is going through hyperinflation. Germany used inflation to pay reparations, abolish their national debt and build up the regime. Just as today, the effects of this monetary policy were not obvious at first. At the time, no one really understood that it was the Central Bank that was causing the problem. Foreign exchange problems were blamed as well as other things like the weather (as is being blamed in Zimbabwe now), but above all, speculators. Speculators were at the top of the list of evildoers. The Central Bank was seen as the main problem only in retrospect. After the hyperinflation started in Germany, the National Socialist Party (Nazis) took power. There was a connection between the two. Bernd Widdig, the author of the book Culture and Inflation in Weimar Germany, had an interesting theory. He said that money helps shape our values and what we do. When the money dies, what do you turn do? The argument of the National Socialists was: “Your money has failed you, the speculators and the money lenders (as they described the Jews) have failed you. You can’t depend on capitalism anymore. You need something else, something that is going to last. That is Germany. That is what lasts, not money, not capitalism. You need order, order rooted in blood.” The German people accepted what the Nazis said only because the money had failed. When the money fails a society starts to fall apart and people will accept ideas they never would have accepted before. There are other effects from inflation as well. It gives politicians an “unrestrained vision” – Going hand in hand with the expansion of government is its “unrestrained vision.” Recent administrations thought they could conduct two wars and then have free healthcare for everybody. Politicians want to promote that an education for everyone is a “right.” They want to give each child born a $5,000 trust. They say everyone deserves their own home, and at least one car along with a myriad of other things. When you have the printing presses running 24 hours a day, 7 days a week, every-thing is possible. It crushes charitable institutions – In the 1930s, in preinflation Vienna, there were huge non-profit agencies with money to care for widows, orphans and the poor. Organizations that would rival charities today. These organizations were all wiped out in the inflation. These were the institutions that stood between the people and the Welfare State. The uncertainty of hyperinflation provides a ready excuse for people not to support charitable institutions and they will fall into decline. It turns people against capitalism – This is a dangerous aspect. Just as in Weimar Germany, people blamed the “greedy fat cats” for the nation’s woes. In today’s Greece there is a pent-up resentment towards corporate executives. They blame “the bosses” for Greece’s economic troubles rather than the rampant government spending. In the United States, even though the present tax code will hit taxpayers at all levels, it is being purported as only affecting “the rich,” those with annual incomes over $250,000. The rationale is that after a while, “you have made enough money.”7 The administrations of several western countries are turning towards socialism even as socialist countries (i.e. Russia & China) are lecturing them on excessive government spending and control. It subsidizes debt and addiction to credit – When the value of money decreases over time, it doesn’t make sense to people to save money for everything. If you are going to “live in the present,” it seems reasonable to buy on credit and pay the debt back with cheaper money. People become addicted to credit. People will max out their credit cards even as the banks tighten down on credit. Today, there is actually an organization called Debtors Anonymous, to help people with credit addition. Debtor-support groups have sprung up around the country to help combat the problem. The result is a rampant materialism – As people have to dwell more on money and finances because of inflation, society becomes more materialistic. More and more people will trade their spiritual well being and family relationships for more money to make ends meet. People will work longer than they planned because their savings have been wiped out. They may have to take a job far away from their home and family. This inflation-induced geographical mobility weakens family bonds and loyalty to their country. 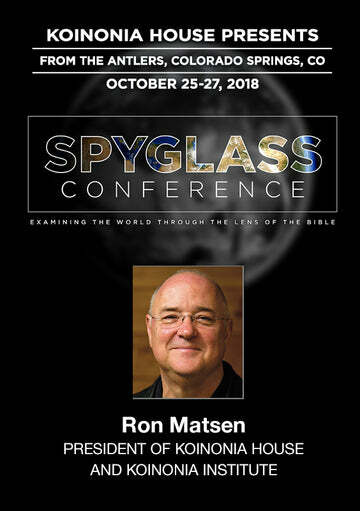 People who take their eyes off God and turn them toward the things of this earth fall prey to sin.9 The biggest danger here lies in people’s focus turning away from the things of God towards the things of man. While we need to be good stewards of the material goods the Lord provides us, being too concerned about the things of this world can lead to a cancer in the soul as James said.10 Throughout these uncertain times, we need to be mindful of the things of God, rather than the things of this world. If we keep Christ in the center of our lives, we will keep our time here on earth in perspective and better weather the coming financial storm. 1. The Moral Ravages of Inflation, http://blog.mises.org/8289/the-moral-ravages-of-inflation/. 2. Senor, Dan and Saul Singer. Start-up Nation: The Story of Israel’s Eco-nomic Miracle. New York: Putnam, 2009. 3. Remarks by Governor Ben S. Bernanke, Before the National Economists Club, Washington, D.C., November 21, 2002, www.federalreserve.gov/boardDocs/speeches/2002/20021121/default.htm. 4. Hyperinflation: Money to Burn, http://millennium-notes.blogspot.com/2009/08/hyperinflation-money-to-burn.html. 6. Excerpt from Congressman Pete Stark’s Town Hall Meeting 7/24/2010, Hayward, CA, www.breitbart.tv/congressman-at-town-hall-the-federal-government-can-do-most-anything-in-this-country/. 7. Obama: You’ve Made Enough Money, www.youtube.com/watch?v=k0JkyZx1LdQ. 8. 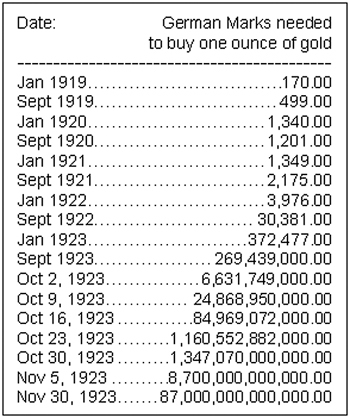 The Cultural & Spiritual Legacy of Fiat Inflation, http://mises.org/daily/1570#_ftn3.